This podcast deals with the pronunciation of the simple past tense, and we will practice with some very useful verbs. If you want to become good at English, you must perfect your pronunciation. I do not refer to your accent. I mean you should pronounce words according to their grammatical groupings. Here we will analyze the pronunciation of some common verbs in the simple past tense. I have included a chart of these verbs in the PDF below. 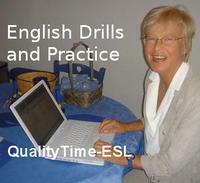 QT-ESL 54 "Pronouncing Verbs in the Simple Past Tense"